The reason this struck me was because as a "1/1" card, you would think that it would be unique, and not just a mirror background in another color. That is the only real difference, the background was flipped and the color. Otherwise this is just an average print card labeled "1/1" for yo-yo's like me who desperately want to own such cards to put another benchmark into their collection. Maybe I am being dramatic, or maybe I just expect too much from an industry that is already starving for better designs and ideas. Either way, I'm not giving my card up. Are you a Jays fan or just a Lind fan? I am curious to see this collection please post pics? If you go to one of my maildays, you can click on all the posts tagged with "Adam Lind" and see most of my cards that way. I'm pretty sure I have posted pics of all of them at one point or another. Not a Jays fan by any means, just lookin' out for my boy. 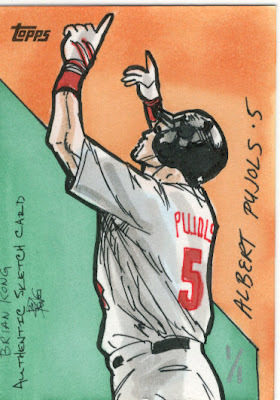 Yeah, I started tracking these "1 of 1" cards a few months ago http://grandcards.blogspot.com/2009/02/topps-sketch-cards-get-sketchier.html and there were more than 10 of them for Ty Cobb and a handful for Granderson all in 2009 Topps--many of which look the same. Its a sad reality. The nice thing is that these are nice cards to have, and REALLY nice cards to pull, they're just not worth paying "1 of 1" prices for on eBay.